Wow. August saw interest rates halve in the UK. That isn’t something many of us are ever going to see again. UK base rates are now 0.25%. Some UK corporate clients are being charged for deposits. Amazing times. Of course UK bond prices, which inversely track interest rates (or, more precisely, expectations of interest rates) have risen. Actually they haven’t risen by a striking amount – partly because expectations had been adjusting ever since the fateful day 23 June in which the UK very narrowly voted in favour of Brexit, whatever that means (it means Brexit – Ed.). SLXX, the iShares Corporate Bond ETF that I regard as a good proxy for UK bond prices, peaked at 156 in early August, up 20% from 130 in February. In other news, UK equities rose a bit too. Economic confidence seemed to be returning slowly to the UK, driven by a bunch of fact-free UK press reports that the economy is doing OK actually. 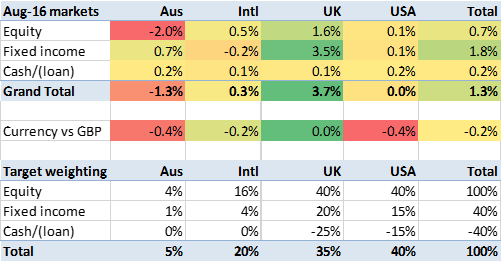 Overseas, markets were generally flat. The pound actually rose very slightly against the three I track (USD, EUR and AUD). The average market movement, weighted by my target allocation, was up 1.3%. Not bad for a month, but relatively stable compared to recent increases. How did my portfolio do? It was, again, up: this month by 2.2%. This makes my three month gain +12.1%, which is just a bit higher than the ~11% the pound fell, at its worst, a couple of weeks ago. My year-to-date gain is +18%, which is probably a record for me. And my twelve month gain is +21% – helped by the big dips that occurred in August last year. These figures are pretty extraordinary and certainly give me a significant Brexit Bonus, in my home currency at least. My gearing, whereby about 30% of my portfolio is borrowed (at now even lower rates), has magnified my gains versus the ungeared market averages. While my performance figures look pretty remarkable, anybody who had a fully diversified global equity portfolio would have reported very similar performance: for instance, Vanguard’s VWRL All-World Equities ETF is up 17.5% year to date, plus dividends. With my overweight UK weighting I am pretty fortunate to be at the same level; this is basically because of my significant bond exposure, given that bonds have (quite unexpectedly, and to the great gnashing of many FI/RE teeth) risen so impressively this year. I said last month I was finding these giddy heights a bit uncomfortable (c.f. Monevator’s timely post), and would cut my exposure a little; I have done this but only minimally. I plan to continue to trim back my positions and reduce my debt. “the UK very narrowly voted in favour of Brexit”: especially given that any vote-rigging would probably have been on the side of Remain, I’d say the margin was quite clear. 17m voted one way, 16m the other way. If there was vote-rigging it was not letting long-term (EU) UK residents and 16/17 year olds vote, of whom there are many more than 1m, and who would have voted to Remain by a massive margin. My point isn’t that the result is contestable, but rather that there isn’t a clear consensus in the UK for Brexit. In fact we are a very divided country, split almost down the middle. Not letting children vote, who have never been able vote in the past is the opposite of vote rigging, in fact it would have been vote rigging to let them vote… Although the evidence shows that the younger voters mostly stayed home then had a cry about the result afterwards. They had a vote in the Scotland referendum. The stats I saw suggested 60% turnout from youngsters, and >>80% for oldies.